By Angela Bynum of Chicago, IL. Teacher, poet and entrepreneur Angela Bynum is an African American formerly employed with the Chicago Public School System,retired to pursue her dream as a full-time entrepreneur as CEO of her company which has expanded in recent years. Sales have increased due to the demand of her products in Chicago stores and gift shops, her Internet Web-Site www.angelgreetings.com and her growing clientele. She has received many awards in recognition of her cards and poems, some have been selected by the National Library of Poetry. She received The Editor's Choice Award and The International Poetry Hall of Fame. 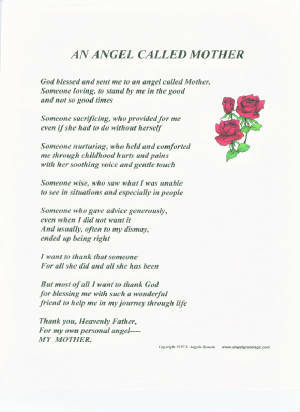 Mrs. Bynum is a Christian, and her devotion is expressed in many of her poems that have brought comfort at times of grief and sadness from the loss of loved ones, special occasions such as graduations, birthdays, anniversaries, celebrations of new babies, weddings and marriage, spiritual relationship and devotions, and friendships. Just in time for MOTHERS DAY, Sunday May 10th 2015. Place your order for Priority Mail by Tueday May 5th. 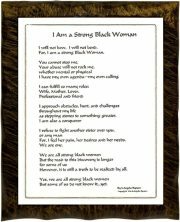 Shipping Fee additional $6.95 for Framed and Non-Framed Poems. Plaques not available for mail delivery. These prices do not include and are not available for shipping and handling or mail delivery. Items are delivered when purchased. These items are not available at this time for mail delivery. Must purchase in person or pick up delivery.